If you have ever wanted to work from home as a freelance writer, Your Questions Answered Bundle One is the perfect place to start. In Your Questions Answered: Top Questions About Freelance Writing you will find an abundance of information, all geared to helping you decide if this is the right job for. The greatest part of freelancing, of course, is that you can work from home. 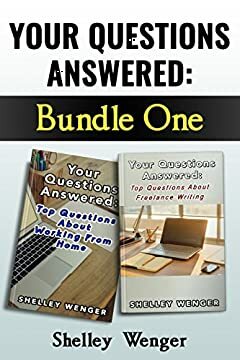 But before you decide to take the leap and become a freelance writer who works from home, you should get a copy of Your Questions Answered Bundle One . It will answer all your questions and prepare you for the future.